Do you have a question about an order? Need help with caring for a plant or arrangement you recently received? We're just a click or a call away! Fill out the info below and we'll help in any way we can. 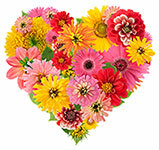 You can also email us at orders@mcintireflorist.com or call us at 888-875-7763. Local? Call us at 573-642-3384. Type in any questions you may have in the box below. If you have a question regarding an order, please include your Netticket Number. We occasionally send out special discounts or promotional offers to our customers via email. If you would like receive further email from us, please check this box.